This was the very first Christmas Mystery wayyy back – you can recreate it here with all it’s glittering parts and ornaments. It is not longer available in the class form of 12 parts, but if you follow the instructions, you will work exactly in the order it was published then. 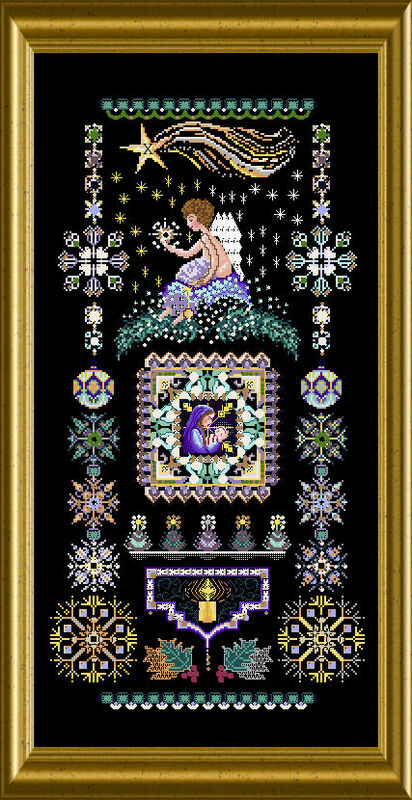 A beautiful scene of a small Cherub on a fluffy cloud holding a sparkling star, baubles and fir branches, a burning candle and the center medallion of Mother Mary with the Child – which can be stitched over one or over two – just to your taste. Besides the normal cross stitch, you will use well explained Special Stitches for added dimension and texture. Smaller motives can well be used to create greeting cards or small gifts! A lovely choice of different threads and braids, beads and crystals make the stitching an entertaining experience. Martina,I have been trying to organize my stitch room and have discovered so many unfinished projects including your Christmas Mystery I from 2004. I loved working on this beautiful piece. I believe I completed through part 5 and most of part 6 – one snowflake finished and second snowflake almost finished. half of it. I Havent started the Rhodes stitch border under the snowflakes. I want to finish it. I have all the instruction, and I think most if not of the beads and crystals but have not found any of the threads. If I don’t find them, can I buy just the threads? Thank you. I was so excited to find you and your beautiful designs on line! isn’t it sometimes a surprise , what you “find” when re-organizing ?? I do not sell any supplies – but you surely can ask Cindy from European Cross Stitch Comp. – she offers kits and partial kits. Thank you! I’ll try her.